Words will not suffice to extol the goodness and benefits of Turmeric. Apart from being a staple ingredient in Indian cooking, it is perhaps one of the earliest known herbal remedies with records dating back its existence to as early as 600BC. Curcumin found in the root of the turmeric is said to have amazing healing qualities. Apart from adding color and flavor to food, turmeric acts as an antiseptic and it perhaps knows its powers that Indians have made it an integral part of their everyday cooking. Turmeric soothes the liver and cures indigestion. Lowers Cholesterol and is an effective antibiotic. Cures irritable bowel syndrome and is best recommended to get rid of hang over. Turmeric has great cosmetic value. Regular use is said to make skin, soft, smooth and fair and reduce the growth of facial hair. The presence of turmeric plants around the house is said to ward of snakes and leaves of turmeric plant are said to be good mosquito repellants. An ideal concoction to relieve cold, cough and chest congestion. Best had before going to bed at night. Mix all ingredients and heat milk on low flame till it is very hot. Stir well and have it as hot as you can. 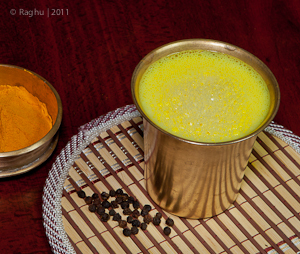 Add ½ tsp of sugar for children who may fuss a bit to have the turmeric milk as it is. This entry was posted in Recipes and tagged antiseptic, Cooking, Curcumin, Food, India, Indian Medicine, Medicine, Milk, Turmeric, Yellow by photosundari. Bookmark the permalink.